This morning I thought I would test out the new Coleman stove we got for our summer travels. About a month ago we went off to Cabela's and purchased a Coleman Gladiator stove after watching endless YouTube videos and reading reviews when ever I could find them. 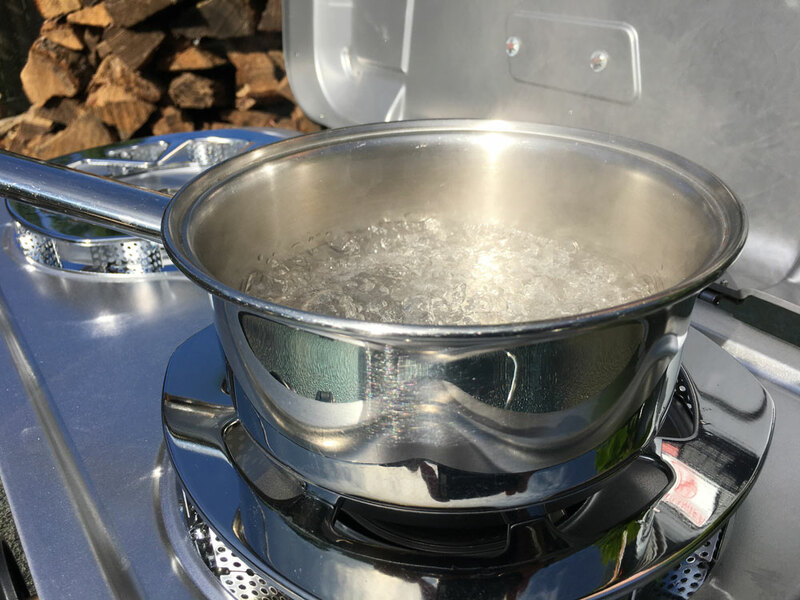 The conclusion was that the Coleman Gladiator was the most rugged and best operating stove. At best, you can make yourself believe the hype and feel satisfied with your purchase. Anyway, it has sat in it's box in the cellar for the past month and this morning I decided to unbox and give it a test run while I was having my coffee. You can see in this picture that it is not only the Gladiator series but the Fyre champion. I am guessing if you spell fire with a Y you are much better product. Not only that it has 'Hyperflame Technology'. Who thinks up this stuff. . . I did find that the stove was packed very well within the box and nothing was damages and it had no parts missing, so that's a plus. When I opened the lid I found that all the components were well padded and the stove didn't even have a scratch. Nice job Coleman. Packed in here were two griddles along with the windscreens and the adapter for a bottle of propane. The bottle I used has been on a shelf in my workshop for several years, but it was handy. As I unpacked I was filling the recycle bin with lots of cardboard and styrofoam. I hate styrofoam. Several years ago when we sailed across the Atlantic, we saw styrofoam floating in the water, everyday. So here it is all put together and ready to be tested. I poured myself another cup of coffee and filled a sauce pan half full of water and set it on to boil. By the way the stove lit on the first try and really put out some heat. I sat the sauce pan on the burner and started the stopwatch on my phone to see if it could live up to all the bulls**t that I heard in the videos. We were at a full roiling boil in 2 minutes 34 seconds. Case closed!